Cook penne in large saucepan to desired doneness as directed on package. Drain; return to saucepan. Add basil; toss to coat. Cover to keep warm. Meanwhile, heat large nonstick skillet over medium heat until hot. Add sausage links, bell peppers and onion; cook 6 to 8 minutes or until sausage links are browned, stirring occasionally. Add tomatoes and tomato sauce; mix well. Reduce heat to medium-low; cover and cook 13 to 15 minutes or until sausage links are thoroughly cooked and sauce is of desired consistency, stirring occasionally. Serve sauce over penne. Sprinkle with cheese. 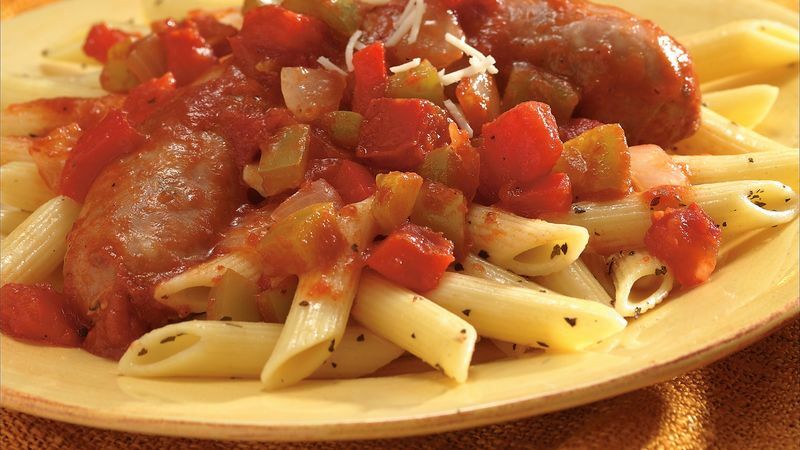 Sausage with peppers and pasta is a popular Italian-American restaurant favorite. This version is easy to make; spicy Italian sausage and seasoned Italian tomato sauce add lots of flavor. Like Parmesan, Asiago cheese is a firm, aged grating or shredding cheese. Look for containers of shredded Asiago in the grocery store deli or cheese department. Mild Italian sausage can be used in this recipe. Parmesan cheese can be used in place of Asiago. Romaine lettuce tossed with creamy Italian dressing is nice with this penne dish. Spumoni ice cream is a refreshing dessert.